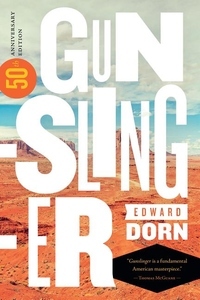 This fiftieth anniversary edition commemorates Edward Dorn's masterpiece, Gunslinger, a comic, anti-epic critique of American capitalism that still resonates today. Set in the American West, the Gunslinger, his talking horse Claude Lévi-Strauss, a saloon madam named Lil, and the narrator called "I" set out in search of the billionaire Howard Hughes. As they travel along the Rio Grande to Truth or Consequences, New Mexico, and finally on to Colorado, they are joined by a whole host of colorful characters: Dr. Jean Flamboyant, Kool Everything, and Taco Desoxin and his partner Tonto Pronto. During their adventures and hijinks, as captured in Dorn's multilayered, absurd, and postmodern voice, they joke and smoke their way through debates about the meaning of existence. Put simply, Gunslinger is an American classic. In a new foreword Marjorie Perloff discusses Gunslinger's continued relevance to contemporary politics. This new edition also includes a critical essay by Michael Davidson and Charles Olson's idiosyncratic "Bibliography on America for Ed Dorn," which he wrote to provide guidance for Dorn's study of, and writing about, the American West.